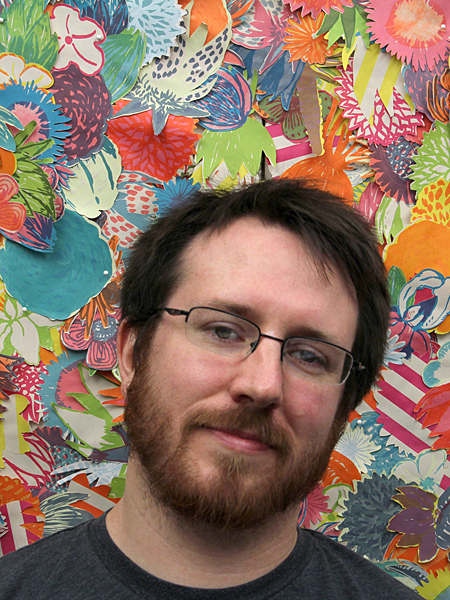 Ames, IA — Artist Andrew Kozlowski, an assistant professor of printmaking at University of North Florida, will present a lecture and workshop Sept. 20-22 at Iowa State University. Kozlowski, whose work explores how human histories are shaped by the objects we possess, will speak about “Art and Our Culture of Ephemerality” at 6:30 p.m. Thursday, Sept. 20, in the Iowa State Memorial Union’s South Ballroom. Using images of his own work, Kozlowski encourages audiences to reflect on objects of high and low culture around them, from ancient urns and historical artifacts to today’s discarded beer cans and building debris. An exhibition of Kozlowski’s recent work, “Under (Printed) Construction,” will be on display Sept. 12-21 at the ISU Design on Main Gallery, 203 Main St., Ames. The show will include an installation of screen- and relief-printed images wheat-pasted to the gallery walls. A closing reception with refreshments will be from 7:30 to 9 a.m. Friday, Sept. 21. Following the breakfast reception, Kozlowski will lead a workshop during which the wheat-pasted images will be removed and recycled into new paper. Participants will have an opportunity to make their own relief prints on the recycled, handmade paper. The workshop will take place from 9 a.m. to 5 p.m. Sept. 21 (with pizza lunch included) and 9 a.m. to noon Saturday, Sept. 22. To participate, please sign up online. All events are free and open to the public. Kozlowski’s work has been included in numerous group exhibitions throughout the United States and abroad, as well as solo exhibitions at the University of Mary Washington’s duPont Gallery, Fredericksburg, Virginia; 1708 Gallery, Richmond, Virginia; and the Philadelphia Print Center, Pennsylvania. Kozlowski holds a Master of Fine Arts in painting and printmaking from Virginia Commonwealth University and a Bachelor of Fine Arts in printmaking from Tyler School of Art, Temple University. In 2009, he completed a residency at the Frans Masereel Center in Belgium and was awarded a 2011-2012 Virginia Museum of Fine Arts Fellowship for his work in printmaking. Kozlowski’s visit is sponsored by the Department Art and Visual Culture, CODAC (College of Design Art Club), Green Umbrellas, graduate program in sustainable environments, University Print Society and ISU Committee on Lectures, which is funded by Student Government.